Dear readers, please read the full story of how an Ahmadi murdered Fakhar-ud-din Multani in broad day light. We found books by the son of this Muslim brother. Read the full story here, https://ahmadiyyafactcheckblog.com/2018/03/25/new-data-on-the-murder-of-fakhar-ud-din-multani/. Dear readers, we have found some new data on the murder of the Ex-Ahmadi, Fakhar-ud-din Multani, which happened in 1937, in broad daylight in Qadian. We have a document which is the official judgement from the Lahore high court, wherein an Ahmadi was punished with the death penalty. This breaks the Ahmadi argument that Qasim Rashid keeps making that “not a single act of terror” by any Ahmadi. This document proves that the Khalifa radicalized Ahmadi’s to kill any people who opposed the Mirza family Khilafat. Fakhruddin Multani was a prominent official of the Qadiani faction of the Ahmadiyya. He managed the printing and publication office in Qadian, India. In 1937, he asked for a public inquiry into the moral character of Mirza Mahmud Ahmad. Since Mirza Mahmud Ahmad had established a personality cult around his person, he took a very dim view and started to incite his followers to ostracize, harass and harm the dissenters. He was stabbed by a fanatical Ahmadi on the 6th or 7th of August, 1937 and succumbed to his injuries on the 13th of August, 1937. The murderer, Aziz Ahmad, was lauded by the Ahmadiyya community, as well as by Mirza Mahmud Ahmad. 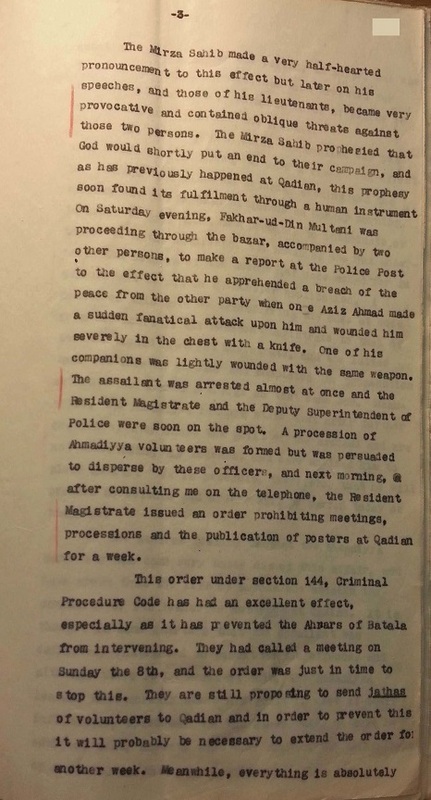 Eventually, the Deputy Commissioner of Gurdaspur had to intervene and strongly encouraged Mirza Mahmud Ahmad to renounce violence in his Friday sermons, or else the authorities would have to take action against him. Mirza Mahmud Ahmad relented, spoke out against violence, and backed off from the legal defense of the murderer, who was subsequently convicted and hanged. After the hanging, his funeral prayers were still conducted with fanfare in Qadian. The other dissenters had to leave Qadian on the best advice of the authorities. 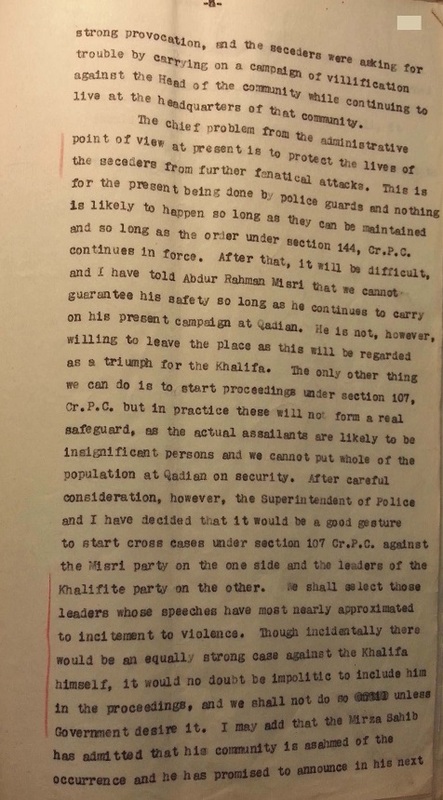 Recently released documents from the British government of the time, reproduced below, corroborate the above sequence of events and also vindicate the story of Bashir Ahmad Misri, the son of Abdur Rahman Misri, one of the three main dissenters. 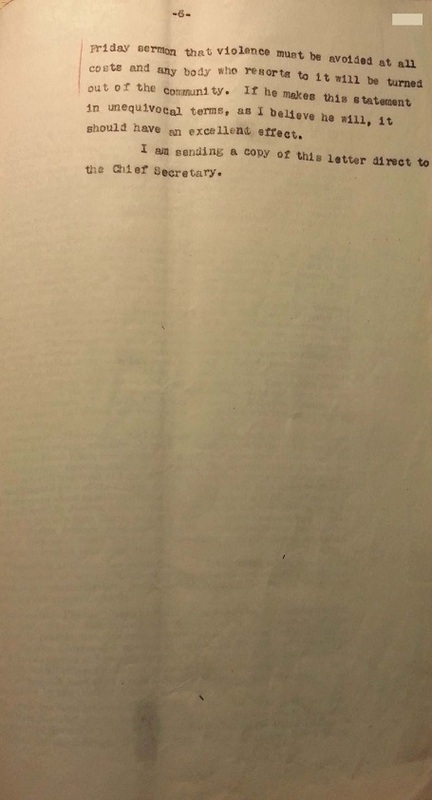 Para.1. There has been further trouble with the Ahmadi community at Qadian which is likely to have wider reactions. Three prominent followers of the head of the community have lately seceded, and have been making charges against the private life of the head and demanding an enquiry. 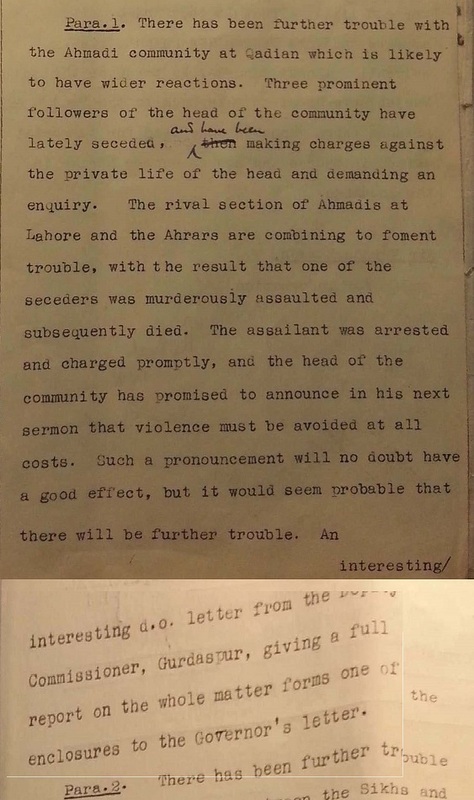 The rival section of Ahmadis at Lahore and the Ahrars are combining to foment trouble, with the result that one of the seceders was murderously assaulted and subsequently died. The assailant was arrested and charged promptly, and the head of the community has promised to announce in his next sermon that violence must be avoided at all costs. Such a pronouncement will no doubt have a good effect, but it would seem probably that there will be further trouble. An interesting d.o. letter from the Deputy Commissioner, Gurdaspur, giving a full report on the whole matter forms one of the enclosures to the Governor’s letter. There is little to report for the past fortnight, but what there is relates to a communal or sectarian feeling. 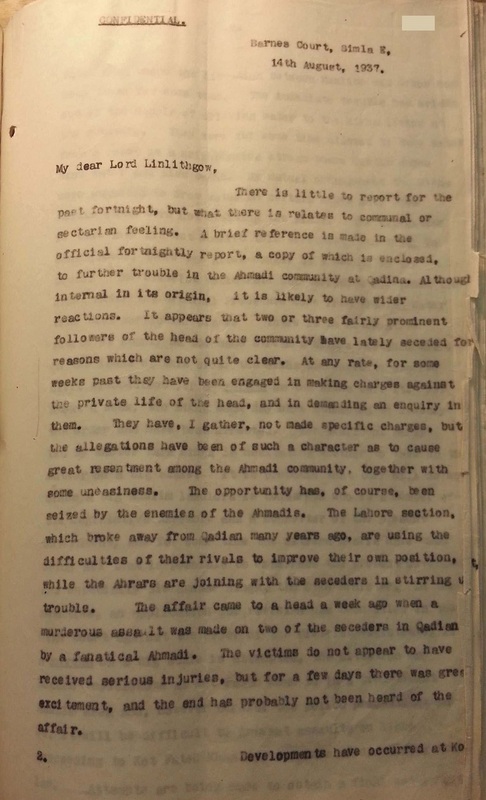 A brief reference is made in the official fortnightly report, a copy of which is enclosed, to further trouble in the Ahmadi community at Qadian. Although internal in its origin, it is likely to have wider reactions. It appears that two or three fairly prominent followers of the head of the community have lately seceded for reasons which are not quite clear. At any rate, for some weeks past they have been engaged in making charges against the private life of the head, and in demanding an enquiry in them. They have, I gather, not made specific charges, but the allegations have been of such a character as to cause a great resentment among the Ahmadi community, together with some uneasiness. The opportunity has, of course, been seized by the enemies of the Ahmadis. The Lahore section, which broke away from Qadian many years ago, are using the difficulties of their rivals to improve their own position, while the Ahrars are joining with the seceders in stirring up trouble. The affair came to a head a week ago when a murderous assault was made on two of the seceders in Qadian by a fanatical Ahmadi. The victims do not appear to have received serious injuries, but for a few days there was great excitement and the end has probably not been heard of the affair. 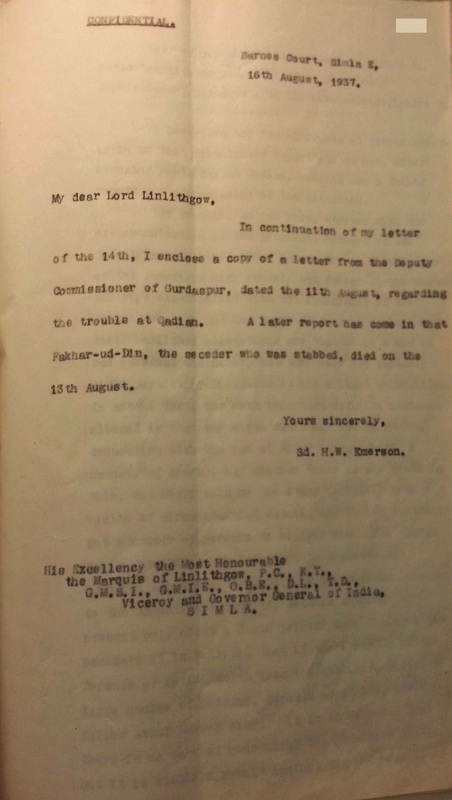 In continuation of my letter of the 14th, I enclose a copy of a letter from the Deputy Commissioner of Gurdaspur, dated the 11th of August, regarding the trouble at Qadian. A later report has come in that Fakhar-ud-Din, the seceder who was stabbed, died on the 13th August. I described the recent events at Qadian briefly in my last fortnightly report and am now, after spending yesterday at Qadian, sending you a fuller report and appreciation of the situation. 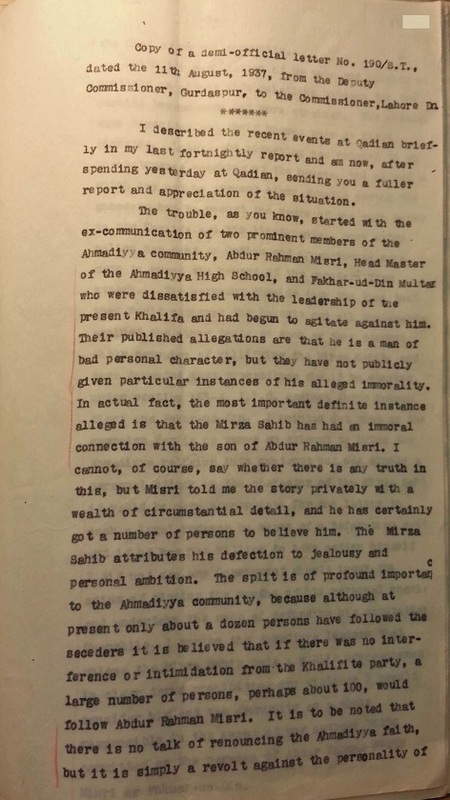 The trouble, as you know, started with the ex-communication of two prominent members of the Ahmadiyya community, Abdur Rahman Misri, Head Master of the Ahmadiyya High School, and Fakhar-ud-Din Multani who were dissatisfied with the leadership of the present Khalifa and had begun to agitate against him. Their published allegations are that he is a man of bad personal character, but they have not publicly given particular instances of his alleged immorality. In actual fact, the most important definite instance alleged is that the Mirza Sahib as had an immoral connection with the son of Abdur Rahman Misri. I cannot, of course, say whether there is any truth in this, but Misri told me the story privately with a wealth of circumstantial detail, and he has certainly got a number of persons to believe him. The Mirza Sahib attributes his defection to jealousy and personal ambition. The split is of profound importance to the Ahmadiyya community, because although at present only about a dozen persons have followed the seceders it is believed that if there was no interference of intimidation from the Khalifite party. A large number of persons, perhaps about 100, would follow Abdur Rahman Misri. It is to be noted that there is no talk of renouncing the Ahmadiyya faith, but it is simply a revolt against the personality of the Head of the community. With the publication of posters and holding of meetings on either side relations between the two parties became more and more strained. The seceders were boycotted and their houses were at first picketed. Later, the picketing was reduced to an un-obstrusive watching of the houses, the object of which was not to prevent other Ahmadis seeing the seceders but to report the names of any such persons to the Khalifa and his lieutenants. Some extra police was sent to Qadian and arrangements were made to guard the houses of the seceders from attack. 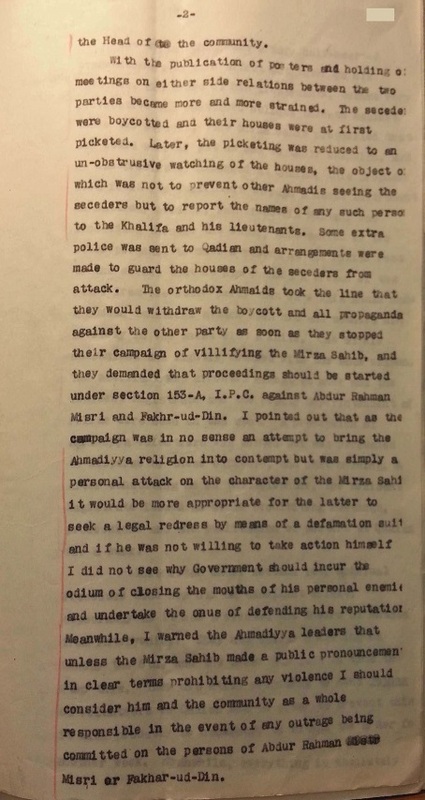 The orthodox Ahmadis took the line that they would withdraw the boycott and all propaganda against the other party as soon as they stopped their campaign of vilifying the Mirza Sahib, and they demanded that proceedings should be started under section 153-A, I.P.C. against Abdur Rahman Misri and Fakhr-ud-Din. I pointed out that as the campaign was in no sense an attempt to bring the Ahmadiyya religion into contempt but was simply a personal attack on the character of the Mirza Sahib, it would be more appropriate for the latter to seek a legal redress by means of a defamation suit and if he was not willing to take action himself I did not see why Government should incur the odium of closing the mouths of his personal enemies and undertake the onus of defending his reputation. Meanwhile, I warned the Ahmadiyya leaders that unless the Mirza Sahib made a public pronouncement in clear terms prohibiting any violence I should consider him and the community as a whole responsible in the event of any outrage being committed on the persons of Abdur Rahman Misri or Fakhar-ud-Din. The Mirza Sahib made a very half-hearted pronouncement to this effect, but later on his speeches, and those of his lieutenants became very provocative and contained oblique threats against those two persons. The Mirza Sahib prophesied that as has previously happened at Qadian, this prophesy soon found its fulfilment through a human instrument. On Saturday evening, Fakhar-ud-Din Multani was proceeding through the bazar, accompanied by two other persons, to make a report at the Police Post to the effect that he apprehended a breach of the peace from the other party when one Aziz Ahmad made a sudden fanatical attack upon him and wounded him severely in the chest with a knife. One of his companions was lightly wounded with the same weapon. The assailant was arrested almost at once and the Resident Magistrate and the Deputy Superintendent of Police were soon on the spot. A procession of Ahmadiyya volunteers was formed but was persuaded to disperse by these officers, and next morning, after consulting me on the telephone, the Resident Magistrate issued an order prohibiting meetings, processions and the publication of posters at Qadian for a week. This order under section 144, Criminal Procedure Code has had an excellent effect, especially as it has prevented the Ahrars of Batala from intervening. They had called a meeting on Sunday the 8th, and the order was just in time to stop this. They are still proposing to send jathas of volunteers to Qadian and in order to prevent this it will probably be necessary to extend the order for another week. Meanwhile, everything is absolutely quiet at Qadian. Only one person, an Ahrar, who was found distributing posters, has been arrested for defiance of the order. An ample force of police is continuing at Qadian for the present. The rapidity with which the challan was put into court is also likely to have a reassuring effect. The outrage took place on Saturday evening and the challan was put in with witnesses on Monday morning. In order to gain time, probably to intimidate or tamper with the witnesses, the Ahmadis, who had undertaken the defence of the accused, at once asked for an adjournment to be put in a transfer application. I countered this move by transferring the case at once from the court of the Resident Magistrate to that of the Additional District Magistrate, and the latter took the case Tuesday and completed the prosecution evidence and framed a charge on that same day. Meanwhile, the Ahmadiyya leaders state that after further enquiries, they admit the guilt of the accused and are not undertaking his defence, and have advised him to plead guilty. It is probable, therefore, that he will produce no defence and orders will be passed today or tomorrow. The general feeling is that the Ahmadiyya community has come very badly out of this affair, and have shown that the life of anyone who attacks the community or its leader is not safe at Qadian. It is thought in some quarters that the assailant was definitely instigated to commit the offence, and although there is no proof of this, the Ahmadiyya leaders must morally share his guilt in view of their inflammatory speeches. 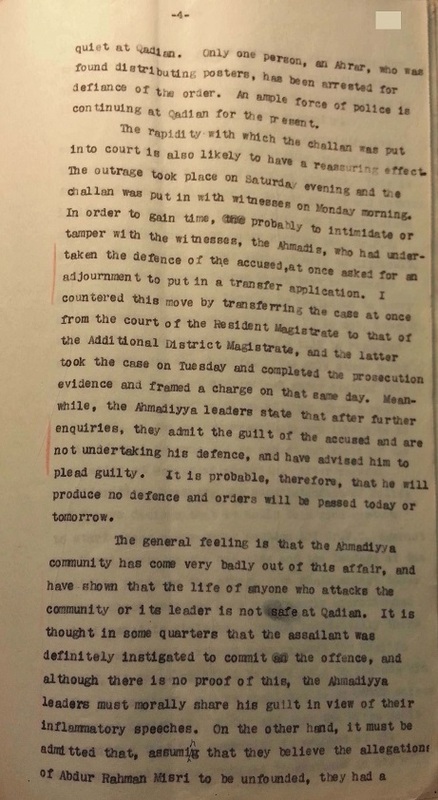 On the other hand, it must be admitted that, assuming that they believe the allegations of Abdur Rahman Misri to be unfounded, they had a strong provocation, and the seceders were asking for trouble by carrying on a campaign of vilification against the Head of the community while continuing to live at the headquarters of that community. The chief problem from the administrative point of view at present is to protect the lives of the seceders from further fanatical attacks. This is is likely to happen so long as the order under section 144, Cr.P.C. continues in force. After that, it will be difficult, and I have told Abdur Rahman Misri that we cannot guarantee his safety so long as he continues to carry on his present campaign at Qadian. He is not, however, willing to leave the place as this will be regarded as a triumph for the Khalifa. The only other thing we can do is to start proceedings under section 107, Cr.P.C. but in practice, these will not form a real safeguard, as the actual assailants are likely to be insignificant persons and we cannot put whole of the population at Qadian on security. After careful consideration, however, the Superintendent of Police and I have decided that it would be a good gesture to start cross cases under section 107 Cr.P.C against the Misri party on the one side and the leaders of the Khalifite party on the other. We shall select those leaders whose speeches have most nearly approximated to incitement to violence. Though incidentally there would be an equally strong case against the Khalifa himself, it would no doubt be impolitic to include him in the proceedings, and we shall not do so unless the Government desire it. I may add that the Mirza Sahib has admitted that his community is ashamed of the occurrence and he has promised to announce in his next Friday sermon that violence must be avoided at all costs and any body who resorts to it will be turned out of the community. If he makes this statement in unequivocal terms, as I believe he will, it should have an excellent effect. I am sending a copy of this letter direct to the Chief Secretary. Paragraph 1. The situation at Qadian where there is trouble within the Ahmadi community remains much the same as at the time of the last report. The head of the Ahmadis has condemned acts of violence by his followers. 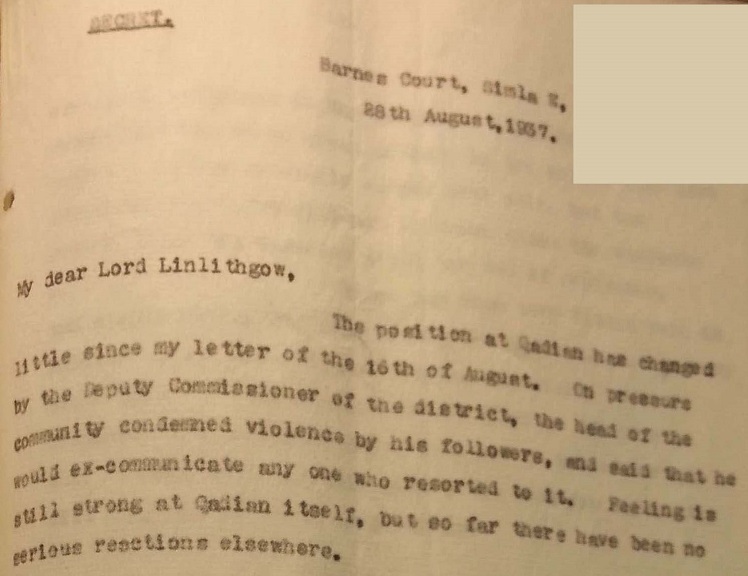 The position at Qadian has changed little since my letter of the 16th of August. On pressure by the Deputy Commissioner of the district, the head of the community condemned violence by his followers, and said that he would ex-communicate any one who resorted to it. Feeling is still strong at Qadian itself, but so far there has been no serious reactions elsewhere. Muslim Affairs. — Dissensions among the Ahmadis at Qadian in the Gurdaspur District culminated in a murderous outrage on the 7th of August. For some time past, dissatisfaction against the head of the community has been growing. A few weeks ago a section of the Ahmadis published a number of denunciatory posters against the Mirza Sahib and after proclaiming one of its members as the new AMIR, seceded from the Ahmadi fold. The secessionists were ex-communicated and their heretical conduct was condemned in strong terms by the Mirza Sahib and other orthodox Ahmadis. Finally on the 7th of August an Ahmadi fanatic stabbed two of the excommunicated Ahmadis with a knife, causing fatal injury to one of them. The assailant was arrested and is now undergoing trial. The Deputy Commissioner of Gurdaspur is of the opinion that the outrage must be considered the direct result of inflammatory speeches made at Qadian a day before and on the day of the attack. Police reinforcements have been despatched to Qadian and an order under section 144 of the Criminal Procedure Code prohibiting meetings and publications of the provocative literature has been enforced in the town as a precautionary measure. The excommunicated Ahmadi, who was wounded on the 7th of August, died, but there has been no further trouble in Qadian. There was a newspaper named Mubahila. Editor of that newspaper, Abdul Kareem, use to expose mirza about his lies and ghastly character from books of mirza Qadiyani. On 23rd April 1930 , one follower of mirza qadiyani attacked Abdul Kareem, inflicted serious injuries upon him and killed his one companion Haji Muhammad Hussain for the honor of mirza. Qazi Muhammad Ali was arrested and sent to jail where proceedings of his case started on 1st November 1930. After proceedings Capital Punishment was awarded to Qazi Muhammad Ali under two charges, Murder and attempted Murder. Appeal was filed in higher courts but rejected, consequently Qazi Muhammad Ali was hanged on 21 May 1931. Today every Qadiyani says that killing for the honor of Holy Prophet Peace Be Upon Him is not justified at all and it is and atrocious act. What they did in case of Qazi Muhammad Ali??? When he Killed Haji Muhammad Hussain, Second khaleefa Of Jamaat supported him in his Friday sermons. He declared that Qazi Muhammad Ali did this out extreme level of faith. He fought his case starting from lower level to high courts and praised him a lot. When he was hanged, second khaleefa send special individual to bring his dead body to Qadiyan. He offered his JANAZA and shoulder the funeral. In official newspaper of Mirzaies they published an article with Heading “Splendid end of respected Qazi Muhammad Ali” in which he was posed as hero. Many people demanded his pictures to blees their eyes with sight of Qazi Muhammad Ali, Those were printed and sold to them. And he is still hero of Jamat for killing an innocent. We always observe and say that Qadiyanies have no relation with Holy Prophet Peace Be Upon Him. They Always degrade Ghazi Ilm Ud Deen who killed Raj Pal for honor of Holy Prophet Peace Be Upon Him, but consider Qazi Muhammad Ali as Hero who killed for mirza. Ahmadi’s have always harassed and disturbed ex-Ahmadi’s. My Pakistan team has recently reported on a case from 8-4-2018. The report is in the below. Remember, Ahmadiyya sources never properly report on anything. We uncovered the data on the Chakwal Mosque incident wherein an Ahmadi fired and killed a Muslim during that altercation, the Ahmadiyya press was silent. We have also uncovered how Ahmadiyya sources lied about the Rabwah incident on May 1974, which eventually got Ahmadi’s declared as Non-Muslims. Nevertheless, the report is posted below. One last thing, there are many gangsters in Rabwah and all the police officers are paid off by the Mirza family. QADIANI GOONDA FORCE TORTURES REVERTED MUSLIM AND EX QADIANIS AT CHINABNAGAR. Qadiani goonda force tortured and injured father and three sons and threatened them of murder. The victims have filed an application before District Police Officer Chenab nagar to lodge an FIR against the Qadiani hooligans. As per details, a father, namely Zahoor Ahmad and his three sons namely Tahir Mahmood , Aqeel Ahmad and Abrar Ahmad resident of Shokatabad Nankana Sahib Punjab, had announce to leave Qadianism and embraced Islam 6 weeks ago. However the wife of Tahir Mahmood, Sana Shad did not agree to accept Islam and had shifted to her Qadiani father,s house along with children at Chenabnagar. Yesterday Tahir Mahmoud along with father and two brothers approached Chenabnagar to see and take his children. The father in law Rustam Ali Shad Qadiani called his Jamaat, ‘s goonda force who badly beat up the newly converted muslims fathers and sons and threatened them for their life. While talking to media, Molana Ilyas Chinioti has demanded the government to take notice of qadiani hooliganism and cause an end to it. Qadianis may be brought under the ambit of Anti Qadianiat Act otherwise he would call for a direct action.